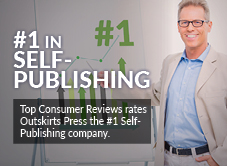 TopConsumerReviews.com has released its 2017 Best Self-Publishing Services list and acknowledges Outskirts Press as the best in the industry. Outskirts Press sets the standard by which all self-publishing companies should be judged and clearly earns our highest rating. Outskirts Press has announced that it has once again been named the Top Consumer Reviews No. 1 company in the self-publishing industry. The company has received top honors for excellence in previous years and continues the tradition of excellence in 2017. Top Consumer Reviews points out in their summary that “Outskirts Press offers a number of affordable programs while still giving you a high level of service.” The review also mentions the many options available, including customizable covers, formatting options, and marketing resources included with each package. It also highlights that authors who publish through Outskirts Press retain 100 percent of their royalties. To read the entire review, please visit http://www.topconsumerreviews.com/self-publishing/detailed-reviews.php. Learn more about Outskirts Press’ top-rated services at Outskirts Press.com. About Outskirts Press Inc.: Outskirts Press helps authors develop and publish high-quality books by offering exceptional design, printing, publishing, distribution and book marketing services. Top Consumer Reviews ranks Outskirts Press No. 1 because they are passionate about delivering outstanding customer service, affordable pricing, industry-leading royalties, and a team of hands-on, U.S.-based publishing experts. At http://www.outskirtspress.com authors can publish their books their way, today.